The Holiday Season is here once again and it’s time to start thinking about gift-giving. 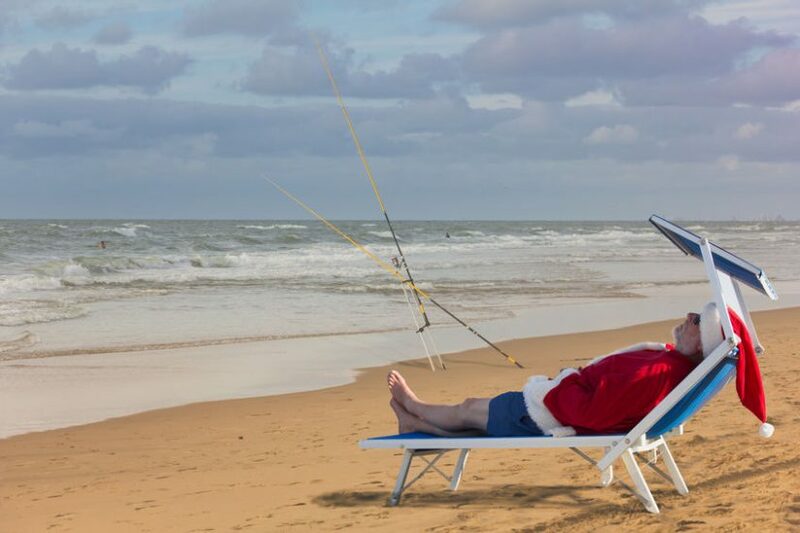 But what do you give your fisherman – the guy or gal – who has everything? Well, that last part may be a misnomer because no matter how long you’ve been at it, no one has everything when it comes to fishing. Plus, even when you think you may have everything you need, you may not have enough of it. When it comes to fishing, there is a good amount of supplies that need to be frequently replenished. Few tackle boxes always have everything an angler needs. Hooks, lures, line and a whole bunch of other things constantly need to be replaced. I’ve lost enough fishing lures and hooks over the years to start my own tackle shop! It comes with the territory. There are also other tackle and gear that we anglers sometimes overlook, never get around to picking up or maybe would just make a welcome addition to our fishing gear collection. Our top 10 list covers a wide range of items for your fisherman husbands, wives, parents, children, friends and so on for this Christmas Holiday and other special occasions throughout the coming new year. Most are quite inexpensive but are sure bets to be appreciated by the angler/anglers in your life – and who knows, you might even find something for your own tackle box too. Every tackle box needs a good multi-tool. I can’t count how many times this little pocket knife/multi-tool has saved the day for me. From cutting a fishing line to opening a beverage bottle, this little tackle box essential has sometimes saved the day. 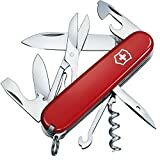 Compact and lightweight, the knife offers 14 different functions and quality that comes from Victorinox, the maker of the original and famous “Swiss Army knife”. Though Victorinox offers several models in varying color options, this one comes in approximately 10 colors including red, sapphire and camouflage. A must-have for any tackle box. I love this space-saving rod storage system! There’s nothing worse than your rod/reel setups huddled into a corner of the garage or taking up valuable space in your home. These storage racks take care of that problem in a nice and attractive way. I have mine fastened to the garage ceiling but they can also be located on the wall or just about anywhere they can be attached horizontally. The racks come in 3 capacity options in either wood or metal construction. The metal configuration comes in black while the wood option offering gives you the choice of either a camo or oak stain/finish. I have the oak and find the color attractive and rich-looking for its more-than-reasonable price. I have to add though, that the wood material itself if pine. I get lots of compliments whenever someone comes through my garage and spots them. More importantly, though, the racks provide an organized space-saving storage alternative. I’m a watch guy, I love them. I also love the outdoors. The Suunto Traverse Alpha is a true outdoorsman wristwatch with features perfectly tailored to hunters and anglers alike. 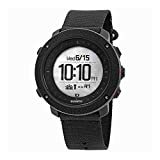 Right off the bat, the watch’s ruggedness and durability in the wild are guaranteed thanks to its military standards construction (MIL-STD 819G). No need to worry about the elements interfering with its function with its water-resistant nylon band, scratch-resistant sapphire crystal, durable stainless steel-coated composite case, and 100 meters (330 ft.) water-resistance capability. Automatic shot detection (great for hunters) – uses GPS technology to keep track and save the location and time of your shots. And these are just some of the incredibly useful features of this watch. If you are going to gift your outdoorsman or fisherman a watch this Holiday, this one is it. We anglers love to boast about the size of the fish we release. 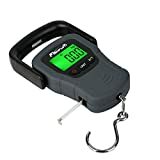 With this handy portable digital fish scale your fisherman won’t have to guess how much that fish weighed, and with the built-in tape measure, he or she will also know how big it was. The scale is strong enough to weigh fish up to 110 lbs (50 kg) but compact enough (less than 8 in. in height and weighs under 12 oz.) to fit comfortably in most tackle boxes. Unlike some other digital fish scales on the market, this one feels solidly built. It comes in a durable, water-resistant rubberized body with a thick ABS retractable handle and a 4-inch stainless steel hook for your fish. The integrated tape measure is a handy tool to have. Other useful features include a large LCD display, power-saving circuitry that allows the scale to operate up to 120 (without backlight) hrs before battery change, auto-off design (after 1 minute of inactivity), low-battery indicator and kg and lb selection. The scale comes with three AAA batteries. These scales are highly accurate and durable and have many other uses besides weighing your trophy catch. I’ve used mine at times to weigh luggage prior to checking them in. Just a very useful gift! With ice fishing season here across many parts of the country, this best-selling combo is a great gift choice for anglers who ply the ice. The spinning rod comes in 3 sizes and strengths: 26″/light, 28″/medium, and 30″/medium-heavy. All come in the standard Ugly Stik black but the 26″ rod is also available in pink. Built on the Ugly Stik’s popular GX2 fiberglass/graphite composite blanks, the rod is both durable and sensitive – perfect for ice fishing. A 20-size basic but reliable single-bearing reel with a graphite body and aluminum spool rounds out the combo. An EVA handle knob makes handling on the ice comfortable. Perfect for bass, perch, crappie, bluegill – even walleye, this is a great little combo as a main setup or supplement to any ice fisherman’s collection. Here’s the perfect gift idea for that special angler just starting out with fly fishing or for someone looking for a good value-priced backup kit. 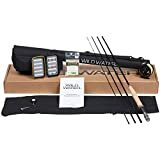 The Wild Water Starter Package offers a complete setup with a 4-piece 9 ft. 5/6 weight IM6 graphite rod, a large arbor aluminum fly reel pre-spooled with fly line, a small assortment of flies, a reference/fly fishing tips guide, a spare 9 ft. 4.3 lb-test leader, a nifty line nipper tool and a retractable/clip-on zinger to attach the nipper tool to your shirt or waders for easy access – basically, everything you would need to start fly fishing. A while back we did a review of 4 top affordable low-profile baitcasting reels. The KastKing Speed Demon was on that list, and since then our opinion of this reel has only grown. As we highlighted in that review, one of the key selling points of the reel was its affordable budget cost and blazing fast 9.3:1 retrieve speed (fastest on the market) – hence “speed demon”. This reel is perfectly suited for the bass fisherman – as well as other anglers – who want to cover a lot of ground fast. But this reel is also attractive and solidly-built with many other features found only in “premium” reels. You’d be hard-pressed to find many baitcasting reels in its price range offering so much. I couldn’t think of a baitcasting angler who wouldn’t want this reel in their fishing gear arsenal, making this a much appreciated holiday gift. Getting your catch home is one thing, preserving and storing it is another. The Nutrichef Vacuum Sealer makes freezing and organizing your fish and fish fillets easier – without having to deal with the dreaded ice crystals formed from freezer burn. There’s nothing worse than filleting your favorite catch and storing it in the freezer to only have to throw it out after a short time because of freezer burn. That’s why I now vacuum seal all my fish as soon as I get them home. I can tell you from first-hand experience that for the angler who keeps all or even some of his/her catch and for fish lovers, there’s probably not a more useful and practical gift than a good vacuum sealer. 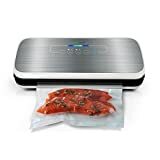 With this compact and easy to use vacuum sealer from Nutrichef, you’ll be able to seal and preserve your fish (and other foods too) up to 5 times longer than with regular zip lock bags or other similar freezer storage bags and containers. This vacuum sealer comes in 3 finishes: black/white, silver/white and stainless steel/black. It also comes with a starter bag package consisting of 5 medium-size vacuum bags and one extra-long bag roll to get you sealing. Not a bad deal! This is another one of those “must-haves” for anglers and one of my personal gift giving favorites. One of the hardest things to do is to try spool a fishing reel on your own. I’ve tried all kinds of ways to spool line onto my reels without the assistance of another person. This includes holding the line spool between my knees while trying to maintain enough tension to lay the line evenly onto the reel – note, it only added to my frustration as the spool would disengage and fall to the floor or inconsistent line tension added fishing line onto my reel in the worst, most uneven patterns imaginable. Even with the help of another person, this is a tedious a usually futile exercise and nobody wants to sit there holding a spinning spool in their hands or with any other contraption while you reel in. 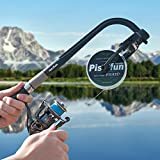 This Portable fishing line winder/spooler is the ticket for those of us who buy our line from anywhere else that is not a bait shop with an electric line spooler or simply like spooling our own reels. The Piscifun personal line spooler is so easy to use, it actually makes the chore a fun one – at least for me! Simply attached the line to your reel using your favorite knot, attach the reel to the spooler handle as you would on any fishing rod, then attach the line spool to the rotor at the other end of the spooler. 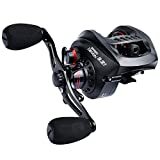 You are now ready to effortlessly reel in your line, spooling it evenly and with the correct tension (adjustable tension) so it’s packed in right. That’s it, it’s that simple! Compact, lightweight and portable, this time and frustration-saving gadget should be a part of every fisherman’s tackle collection. Works equally well with monofilament and braided/super lines and different sized spools. For the fisherman or outdoorsman who wants a portable ice cooler capable of withstanding the rigors of the open water or the wild while keeping the catch and the necessities as fresh as can be for long stretches, this Yeti 35 quart cooler is just right. Constructed with the same Yeti high-quality materials and standards that we featured in our cooler review some time ago, this smaller Yeti is just the right size for a day out on the surf or a weekend foray to a wilderness fishing lake. The Tundra 35 features up to 3″ of Permafrost insulation, thick rotomolded construction, T-Rex latches, and IGBC Bear-Resistant Certification, so you know it will be able to keep its contents cool while protected from the elements. This model comes in 7 color schemes including desert tan, ice blue, seafoam, and white. A fisherman has got to keep the catch cool, not to mention a few cold beverages. To that end, the Yeti Tundra 35 cooler is the perfect holiday present to help him or her accomplish just that. This entry was posted in Tackle/Gear Reviews & Guides on November 19, 2018 by Dorado. Great suggestions! I’ve found that you absolutely cannot go wrong with a high-quality cooler. They make the perfect gift and are always useful to have on hand – even outside of fishing season. Glad you enjoyed the post, Alex, and I couldn’t agree more on the need for a quality cooler. If you want more cooler ideas, you may want to check out this review.